The North American Squirrel Association and the River City Water Ski Team are committed to bringing the joy of water skiing to as many people as possible in the Seven Rivers region. Traditionally, this has happened by putting on shows weekly at the Airport Beach in La Crosse, performing 3-4 shows on the Mississippi River during the Riverfest celebration, and competing in a show ski tournament in Wisconsin Rapids. Many years ago, the team started a learn-to-ski program through local Park and Recreation departments and a juniors program. Three years ago, we hosted our first adaptive ski clinic with the assistance of some instructors from Wisconsin Dells who brought the necessary equipment with them. Over the last couple of years, through the generous support of an anonymous donor and the North American Squirrel Association (n.a.s.a.) we have purchased our own equipment to use for these events. Part of n.a.s.a.’s mission is to help the physically challenged and elderly enjoy recreational activities, so the partnership with River City is a great fit. The smiles and squeals of joy from the kids that have participated in this program are something you have to see to truly appreciate! They LOVE it! We are looking forward to our Water Skiing events next summer. Those dates are June 20th and August 15th, with more info to come. The team’s adaptive sit-skis have adjustable seats to accommodate adaptive skiers of all different heights, sizes and abilities. The adaptive skis handle, called a triple bar, will be used with single leg skiers. 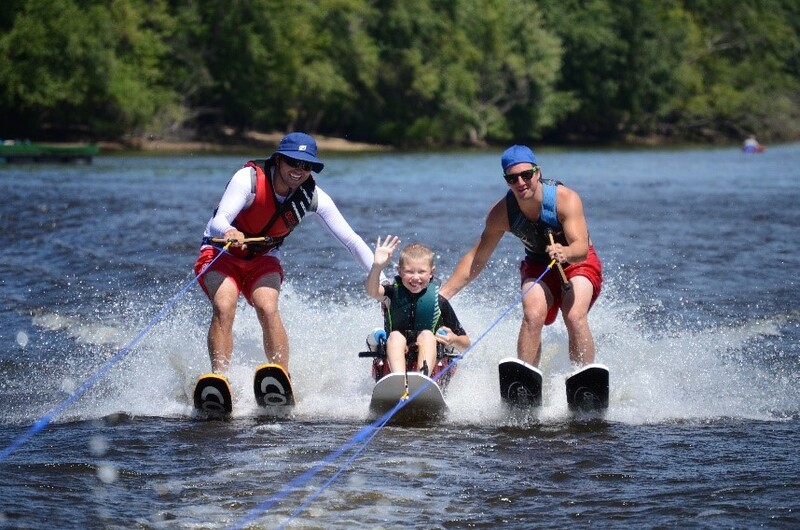 Since its inception, we’ve helped nearly 40 youth experience the joy of water skiing. Our goals for this year are to grow the program to reach adults with disabilities and to help more skiers to ski independently. With the first goal in mind, we’re offering two sessions on each day this year. The morning session will be for participants of any age with a cognitive impairment that may or may not also have physical challenges. The afternoon session is for adults that have physical challenges only. To help more skiers ski independently, we’ll offer the use of outriggers, pictured below, on one of our sit-skis, and we’re excited to be using our new triple bar for the first time. While we have a certified water ski instructor and an adaptive water ski instructor, our instructor attended a clinic on June 11th in Twin Lakes, WI to learn more adaptations and try out additional equipment that we could offer to accommodate more disabilities, such as a Delgar sling to assist skiers with limited arm strength, or only one arm. We are also excited to again partner with the Bethany Ski Team of Bethany Evangelical Free Church of La Crosse to provide additional side skiers and volunteers to work with the skiers on land. Thank you for our sponsor for Waterskiing!